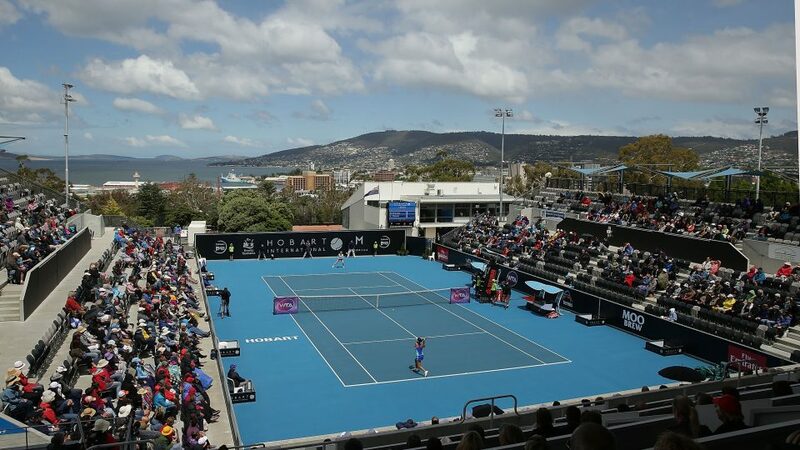 The Hobart International is celebrating its 25th edition in 2018, so to mark the milestone we’ve collated 25 random facts about the event played at one of the most picturesque stops on the WTA Tour. The Hobart International is the oldest current WTA tournament that has never had a repeat singles champion. Since the first tournament in 1994, 356 different women have competed in the singles main draw. Competitors from 49 different countries have featured in a singles main draw match. American Amy Frazier boasts the most main draw singles wins in tournament history with 22 from her eight appearances. She won the title in 2004. There has been 29 Australian women compete in the singles main draw, scoring a combined 50 wins. Two Australians have won the singles title: Alicia Molik in 2003 and Jarmila Wolfe in 2011. Molik and Wolfe are tied for the most successful Australian players in tournament history, with nine main draw singles wins each. Casey Dellacqua is the next best with seven. Italian Rita Grande and Russian Elena Likhovtseva share the record for most main draw singles appearances with nine each. Both played in the inaugural event in 1994. Russian Elena Vesnina and Romanian Monica Niculescu boast the most main draw appearances of current players with seven each. German Mona Barthel has won 12 main draw singles matches in Hobart, the most among active players. Eleven players have won their first WTA singles title in Hobart: Mana Endo (1994), Patty Schynder (1998), Rita Grande (2001), Martina Sucha (2002), Alicia Molik (2003), Zheng Jie (2005), Petra Kvitova (2009), Mona Barthel (2012), Elena Vesnina (2013), Garbine Muguruza (2014), Elise Mertens (2017). The top seed has only won the tournament once: world No.13 Anna Chakvetadze in 2007. An unseeded player has won the tournament on 16 occasions. A No.3 or No.8-seeded player has never won the title. The best performance by a wildcard was from Australian Rachel McQuillan, who reached the 1994 final. Thirteen players have won the title in their main draw debut: Mana Endo (1994), Leila Meskhi (1995), Julie Halard-Decugis (1996), Dominique Monami (1997), Kim Clijsters (2000), Martina Sucha (2002), Michaella Krajicek (2006), Petra Kvitova (2009), Anna Chakvetadze (2007), Jarmila Wolfe (2011), Mona Barthel (2012), Garbine Muguruza (2014), Elise Mertens (2017). Three qualifiers have won the title: Mona Barthel (2012), Garbine Muguruza (2014), Elise Mertens (2017). Inaugural champion Mano Endo received $18,000 prize money for winning the title, with players eliminated in the 1994 first round receiving $700. The 2018 champion will receive $43,000 in prize money, while a first round appearance nets $1,925. Four former world No.1s have competed in the tournament: Tracy Austin in 1994, Serena Williams in 2007, Dinara Safina in 2011 and Jelena Jankovic in 2017. Seven players became No.1 after competing in the event: Simona Halep, Garbine Muguruza, Angelique Kerber, Kim Clijsters, Amelie Mauresmo, Victoria Azarenka and Justine Henin. The tournament was originally played on a green Rebound Ace surface, but switched to a blue Plexicushion surface in 2009. The Domain Tennis Centre was redeveloped during 2009-10, constructing permanent grandstands and a corporate stand to more than double crowd capacity on Centre Court. Three players have an unbeaten singles record at the tournament; Russian Leila Meskhi (1995 champion), as well as Belgians Kim Clijsters (2000 champion) and Elise Mertens (2017 champion). American women have posted the most combined wins in tournament history, with 106 from 43 competitors. Italy and Russia are the next most successful countries, each with 52 wins. Tickets are still available for the 2018 event – book now to join in the 25th celebrations. Who do you think will win the Hobart International 2018 title? Join the #HobartTennis conversation and let us know your thoughts on Facebook, Twitter or Instagram. © 2019 Tennis Australia. All Rights Reserved.